Can Republicans find the Spine to "Contain" Trump? Can Republicans find the Spine to “Contain” Trump? Washington (AFP) – Donald Trump’s unsettling embrace of Russia’s Vladimir Putin this week drew derision across the US political spectrum, but it remains to be seen whether Republicans have the will to rein in their president. The two major American political parties appear largely united in their desire to keep the Kremlin in check, particularly after Trump made the startling assertion in Helsinki Monday, with Putin at his side, that he believed the Russian leader when he said Moscow did not interfere in US elections. That globally televised submissiveness to a strongman was interpreted by many as a betrayal of US intelligence agencies, which had collectively declared that Putin and Russia launched a coordinated attack on the American electoral process in 2016. While Trump’s position on Russian interference has shifted repeatedly in recent days, and fresh comments about NATO cast doubt about the alliance’s mutual defense premise, some in Trump’s party signalled they had had enough with his wrecking ball diplomacy and sought to take steps to box him in. Republican Senator Jeff Flake, with a Democratic co-sponsor, on Wednesday introduced a non-binding resolution that would reaffirm the intelligence community’s assessment of Russian interference, and assert that Moscow be held accountable for its actions. A meatier measure would be a bill, introduced months ago by Republican Senator Marco Rubio and Democrat Tim Kaine that is gaining traction now, that would automatically sanction Russia for any future election meddling. Senate Majority Leader Mitch McConnell suggested Tuesday that he could allow a vote on the legislation. “I think the dam is breaking as it relates to people realizing that we need to have some significant push backs,” Senator Bob Corker told reporters Wednesday. Corker has been adamant about passing legislation that would restrict Trump’s ability to impose tariffs, arguing that taxing US allies pushes them away while strengthening Putin. But while Corker serves as the powerful chairman of the Senate Foreign Relations Committee — where Secretary of State Mike Pompeo testifies next week and will certainly be grilled about Helsinki — he is not running for re-election, and neither is Flake. They are liberated to a degree to voice their frustration, but there is little upside in speaking out for other Republicans seeking re-election this November. Anti-Trump vitriol has backfired on some lawmakers, notably South Carolina congressman Mark Sanford. Trump raged about him on Twitter, and the lawmaker ultimately lost his Republican primary last month to a Trump loyalist. AFP / Andrew CABALLERO-REYNOLDS. 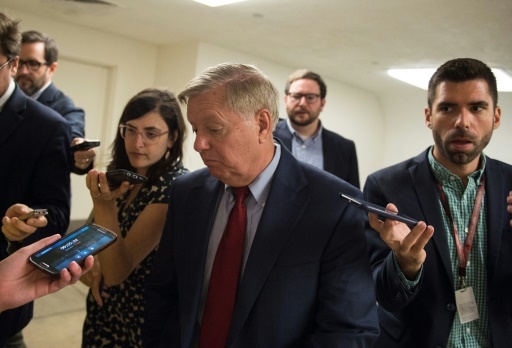 Republican Senator Lindsey Graham said he wants US national security officials to testify before Congress about what was said and negotiated in President Donald Trump’s private meeting in Helsinki with Russian President Vladimir Putin. There is little sign that Republicans are ready to go nuclear against the president. But with Senate Republicans holding a slim 51-49 majority, and Senator John McCain absent while battling brain cancer, a single defector has the power to gum up Trump’s agenda. Republicans “should use their leverage to stop the administration’s priorities” until the Senate passes legislation that protects special counsel Robert Mueller and his Russia probe, and bolsters election security, Senate Democrat Brian Schatz told Politico. “I think there’s a growing wave of alarm” in both parties, Democratic Senator Richard Blumenthal told AFP. Blumenthal and other Democrats want Trump’s interpreter — the only other American in the room when the American and Russian presidents met privately — brought before Congress to testify about what transpired between the two men. Republicans have not publicly warmed to that idea, but some are interested in hearing from Pompeo and National Security Advisor John Bolton, who were likely debriefed by Trump after his Putin sit-down. Major US newspapers, meanwhile, called on the Republicans who control both chambers of Congress to take action. 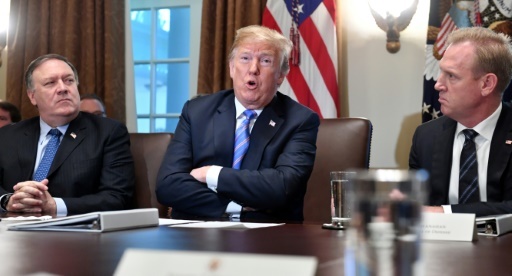 The New York Times, in an editorial titled “Time for Republicans to Grow a Spine,” said Congress should pass a resolution censuring the president over his Helsinki debacle. “Let Mr. Putin know that not every American politician is eager to be his dancing bear,” the editorial board wrote. It also suggested other steps, including boosting the integrity of US election systems and protecting them from further Russian meddling, and calling on Trump to demand the extradition of 12 Russians indicted last week for election interference. Even the conservative-leaning Wall Street Journal editorial board wrote that lawmakers need a “containment strategy” for Trump. “Republicans and Democrats will unite in Congress, as they should, to limit his diplomatic running room,” it said. Featured Photo: AFP / Nicholas Kamm. US President Donald Trump is under fire from Democratic and Republican lawmakers alike after his performance in Helsinki, where he met with his Russian counterpart Vladimir Putin. Michael Mathes is AFP US politics/Congress correspondent.